The Haggard Mind: So... What are You Giving Up? Lent has started. We observed the beginning of the season by participating in an Ash Wednesday service at our church. We reflected on the meaning of the season through scripture, prayer, and homily. Then all who would accept it received a cross-shaped mark on the forehead, formed by the pastor's finger from the ashes of burned palm leaves. It's a common practice that we give up something during Lent. I have participated in this off an on over the years. The only one I actually remember (vividly) is when my mother talked me into giving up chocolate for Lent. I don't remember just how old I was, except it was when I was in grade school. Studies have shown that chocolate is made up of a magic formula-- a mix of bitter and sweet and salty that stimulates every taste bud, plus a blend of hormones and stimulants that can touch the pleasure centers of the brain. For some people, it is highly addictive. And I have to confess that I am one of those people. guy trembled in fear for 40 long days. Anyway, I remember that period as a time of intense suffering. Going without chocolate, under constant attack from the chocolate monkey on my back, was nothing compared to what Christ suffered for me. But in the haggard mind of a kid, it was close. 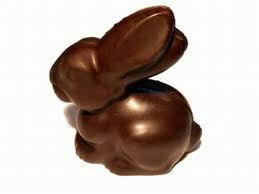 And when Easter arrived-- Well, let's just say that both Hershey's and Nestle's almost went under. Now, though, Lent has different meaning for me. What am I giving up? I'm not going to say. Jesus instructed, “When you fast, do not look somber as the hypocrites do, for they disfigure their faces to show others they are fasting. Truly I tell you, they have received their reward in full. But when you fast, put oil on your head and wash your face, so that it will not be obvious to others that you are fasting, but only to your Father, who is unseen; and your Father, who sees what is done in secret, will reward you." (Matthew 6.16-18) He wasn't instructing us to fast. There's no hard instruction in the Bible to do that. But fasting has its merits, and he says that when you happen to be fasting, don't show it. Well, giving up something for Lent is a type of fasting. So I won't tell anyone what I have given up. Partly because this isn't a show, but also because what I have chosen to give up is between me and my Lord. It is something that only He can take away from me. Jesus gave up something for you. "Jesus said, 'It is finished.' With that, he bowed his head and gave up his spirit." (John 19.30) He gave his life. For you. All he asks in return is your life. We all have areas in our lives that we have not given over to Him. Even you have some rooms in the house of your heart that are still filled with junk, because you haven't allowed Jesus Christ to go in there and clean it out. I have chosen one of those rooms in my heart-- one I have held onto for years-- to give up to Him. It would accomplish nothing to tell anybody else what it is, because only He can clear it out. What are you giving up for Lent? This year, how about choosing something that means something, that will last forever?